I don’t know how I missed this cute picture in my email last week, but I was happy to have found it. 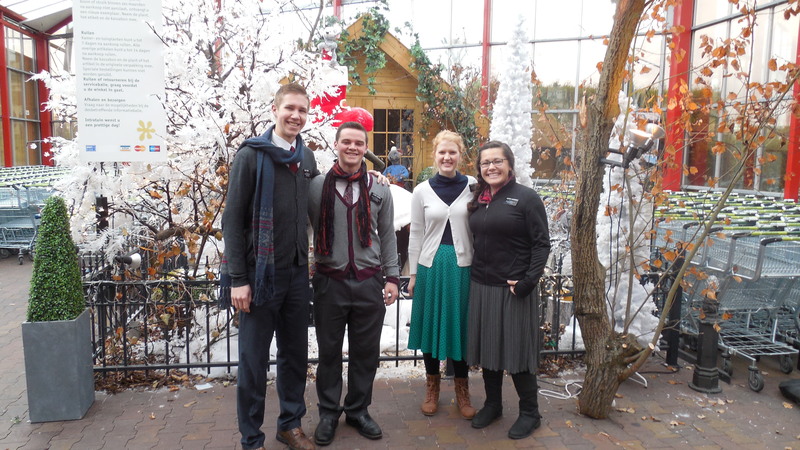 Notice the Elders are wearing sweaters, not suits! This photo almost has a Christmas feel to it. Jess also wanted me to share her address with everyone. —– Jenny P.S. Don’t forget you need an international stamp. Or the equivalent of $1.15. Hi! I am also a missionary mom of a sister in Belgium. For your daughter and her companion’s safety (as well as any sisters who might live in that apartment in the future), I would recommend NOT posting your daughter’s apartment address publicly, on her blog. The mission home address is safe to post publicly, but maybe just post your email address and have people email YOU to request her local address. (and then only give it to people you know) There are many “creepers” out there and it’s better if the sister missionaries’ apartment address isn’t public knowledge. Thanks! Thanks for the great advice!!!! !